The story I am sharing today is a health nightmare that I personally experienced. I am not a medical professional, and the information contained in this post is not intended for medical advice. Statements in this post have not been evaluated by the Food and Drug Administration. This product is not intended to diagnose, treat, cure, or prevent any disease. Always seek professional medical attention when needed. I received free product from Moms Meet to use and post my honest opinions. Compensation for this post was provided and this page may contain affiliate links. Please see my full disclaimer/disclosure. In January 2017 I experienced mastitis, an illness that some mothers experience during the months following childbirth. One Saturday morning I woke up not feeling the greatest. I attended a Young Living Essential Oils event that morning with my mother and went to the circus later that afternoon with my entire family. By the time the circus was over, I was very, very sick with what I would describe as severe flu-like symptoms. I just felt horrible and ended up in the emergency room. I was misdiagnosed with a virus, given a shot to treat the pain, and sent home to rest. The next morning I knew something wasn't right, so I called my ob/gyn. I explained my symptoms over the phone and was given an antibiotic for mastitis as it was necessary to cure the obvious infection. I was instructed to take the antibiotic four times a day for several days. I completed the round of medication, and days later found myself in the emergency room once again. After returning home from Sunday evening church, I fell asleep with my little boy and didn't wake up until 4 a.m. When I awoke, I knew I was sick. I had some digestive problems that caused alarm and realized I would be calling my gastroenterologist as soon as the office opened. Afterwards, I tried to rest, and I ended up waking up early to dress in case the doctor offered me an early morning appointment; however, when I called, I was told I would have to wait for an appointment with the doctor. I think they offered for me to see the nurse practitioner the next day or so. Those details escape me. In the next two hours, I began experiencing the worst pain and sickness I have ever experienced in my life. I suddenly became very cold, began shaking, had terrible leg, abdominal, and ankle pain, and felt an overall sickness that I still cannot describe to this day. I cuddled up in the bed with my little boy in an effort to stay warm and my baby girl was next to my bed in a baby jumper. I didn't know what was going on, but I knew I needed help, so I called my mother and asked her to come over and then called my husband to come home from work. Before either of them could arrive, I called an ambulance. Unfortunately, after almost an hour of waiting for the ambulance, I made it out to the car so my husband could drive me to the ER. As we were pulling out, the ambulance arrived, and I am very thankful. I was seen by the doctors more quickly due to arriving at the hospital by ambulance, and I believe that probably saved my life. The doctors and nurses could not figure out what was wrong with me. I explained to the doctor that I had recently finished an antibiotic and had read on the paperwork that C Diff was a side effect of taking the antibiotic. I believe the doctor was an intern doctor, and even though I inquired about C Diff testing, he did not order a test for that condition. I was left in a room for hours in severe pain and eventually was ordered for a CAT scan. I remember crying and begging the technician who performed the CAT scan to please help me. I honestly believe my nurse didn't understand how sick I was until my heart rate hit about 173+ and my fever rose to over 104. I thought I was dying and felt weak and helpless. I began having all the symptoms of C Diff, and I will let you read all about those on your own time... C Diff in short is inflammation of the colon caused by the bacteria Clostridium Difficile. Not only did I have C Diff but I was also becoming septic which is why I had the pain, fever, and out-of-control heart rate. I was hospitalized for four days and pumped full of antibiotics. Even though C Diff is triggered by antibiotics, it is also treated with antibiotics. I was treated with Vancomycin at the hospital through IVs and treated with it orally after leaving the hospital. Unfortunately, it did not help me all that much long term, and I was in and out of the ER several times in the months to follow. My gastroenterologist treated me with a very pricey antibiotic called Difficid, and it helped me. I also believe probiotics, along with rest and diet change, contributed to my digestive wellness. During my recovery, I took two different brands of probiotic supplements—Florastor® and Life 9™ by Young Living. I love both brands of probiotics and believe each brand has its own uses and strengths. Ultimately and most importantly, the LORD healed me of this terrible illness, and I am extremely grateful to HIM for HIS healing in my life. I could never put into words how sick I was from February until April 2017. It was a very trying time for me, but the Lord brought me through the trial. In September of the same year, I had a relapse of the C Diff. It was not as severe; nevertheless, I was very sick again. I was not septic this time and that made a huge difference in the recovery. I had slacked off the probiotics for a couple weeks prior, and I personally believe that is why the C Diff returned. Once again, I was prescribed Difficid, and it took several days to get insurance approval for the medication. In the meantime, I began regularly taking the probiotics, and although I ended up using the antibiotic, the probiotics helped me greatly until it arrived. After the September episode, I continued regularly taking probiotics until I began feeling well, and I gradually tapered off. I still take them on a regular/ as needed basis as I believe they are so beneficial to health and wellness. According to my gastroenterologist, when a person has been infected with C Diff it can be contracted again more easily. I have heard two schools of thought regarding contracting C Diff. Some believe everyone has the bacteria and when an antibiotic wipes out too much good bacteria, all the bad takes over. Others believe that a person may contract C Diff after taking an antibiotic as it lives in the environment. I personally believe doctors are still learning about this illness as it is becoming more common due to the over-prescribing of antibiotics. I believe antibiotics can be over-prescribed, but in my case, I genuinely needed them. Another point to note is that I took antibiotics regularly as a child due to ear infections and strep throat, and I believe this may have contributed to my weakened intestinal biome. However, once again, I needed the medication as a child. Since having C Diff, my gastroenterologist recommends that I take antibiotics only when absolutely necessary and not for simple things like non-serious sinus infections. He also recommends that I increase probiotic usage before, during, and after taking an antibiotic. I know this story has been very long and complicated, but I want to emphasize the VALUE of probiotics. I was recently given the opportunity to try and review Dr. Ohhira's Probiotics® Original Formula by Essential Formulas. 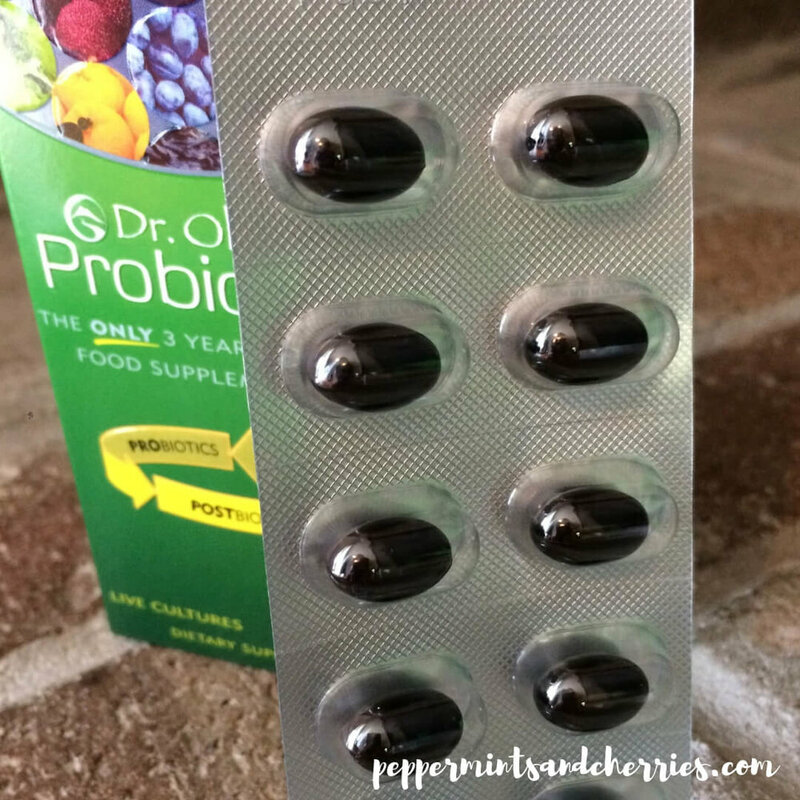 Due to my health history and positive experience with probiotics, I was thrilled to review this particular product. I believe Dr. Ohhira’s Probiotics would have greatly benefitted me during my health struggles; however, I have currently received benefits from these probiotics. Sick people aren’t the only ones who need probiotics! Holiday eating, germs, and sugary sweets can all wreak havoc on our digestive systems! As I have mentioned, antibiotics take a toll on our gut health. Add poor diets, toxins, and stress, and these things only compound the problem. Probiotics help us rebuild our damaged intestinal microbiome. Scientific research is always changing, but many believe probiotics assist with healthy digestion, support a healthy immune system, promote nutrient absorption, assist in healthy weight and appetite maintenance, promote positive mood and brain-gut communication, and more! Dr. Ohhira’s Probiotics is an all-natural, SUPERIOR PRO-BIOTIC developed to support digestive comfort, nutrient absorption, and a healthy immune system. Dr. Ohhira’s award-winning formula is a wholefood supplement consisting ONLY of carefully harvested natural crops (fruits, vegetables, mushrooms and seaweed) and the most crucial component—the luxury of time. Through fermentation time permits nature to transform the earth’s bounty into a probiotic formula that nourishes and balances the body’s bacterial population promoting a positive impact on every aspect of your family’s health. *Fermentation maximizes the natural health-promoting properties of each ingredient. The final result is an organic, living fusion that merges and encourages your own exclusive internal bacteria. This, in turn, supports a healthy immune system and digestion of crucial micronutrients that your body needs to thrive and flourish. -no dairy or gluten, non-GMO, vegetarian, and free of artificial yuckiness! So the bottom line is this… I was introduced to probiotics when I experienced a severe illness; however, probiotics aren’t just for times of illness. I can use them to support my daily lifestyle! If you would like to try Dr. Ohhira’s probiotics, you can learn more from Essential Formulas online. As part of my review, I was also given a Probiotic Kampuku™ Beauty Bar, and I love how it makes my face feel squeaky clean and nourished. It is appropriate for face and body and can be used on a daily basis. This beauty bar is all-natural and is recommended for especially dry and sensitive skin. You should try it too! What’s better than probiotics for the skin to give more vibrancy?!!! You may also want to check out Dr. Ohhira’s Probiotic Hadayubi™ Lavender Moisturizer and the book, The Probiotic Cure by Martie Whittekin. This book was also given to me as part of my review package, and I greatly look forward to reading it… in all my spare time… which is few and far between these days!